Arduino IDE 1.6.13 – all versions, at least 1.5 and above. The Arduino IDE is installed in the default applications folder, as is the Teensyduino. Some knowledge of using the terminal is required. 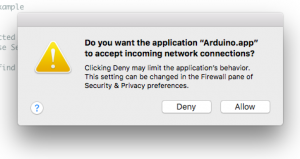 Do you want the application “Arduino.app” to accept incoming network connections? Clicking Deny may limit the application’s behaviour. This setting can be changed in the Firewall pane of Security & Privacy preferences. 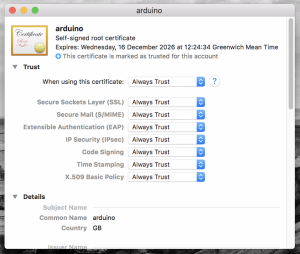 When the Arduino IDE is installed it includes a certificate to assure the system that everything is correct, the Teensyduino installation makes changes to the IDE configuration and this causes a mismatch and the signature in the certificate does not match the installation. 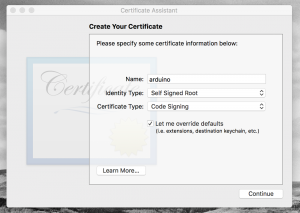 Once created and back in the list, choose your certificate and from the menu go to File > Get Info (Cmd-i). In the Trust section at the top change: When using this certificate to Always Trust. You’ll be asked to verify this, click ‘always allow’. To verify that your certificate has worked, check with codesign, using spctl will not work as this is a self-signed certificate. Now, when you start the IDE on first run it will give you the allow/deny message again, click Allow and on subsequent use it will open as expected. How to get rid of firewall “accept incoming connections” dialog?